I like peanut brittle. I’ve had lots of different variations. Some taste more sweet, some are more… smokey? Like just a touch of burned flavoring. The one thing that they all have in common is that it feels like I’m ruining my teeth. It turns into a sugary cement-like substance and clings to every nook and cranny in my teeth. They need to create some sort of acid that is linked to your DNA so that you could use it as a mouthwash and it would only dissolve foreign particles in your mouth and not melt your face. I seem to spend twice as much time picking peanut brittle out of my teeth than I spend actually eating it, haha. And you thought the pennies in the water tank were bad. 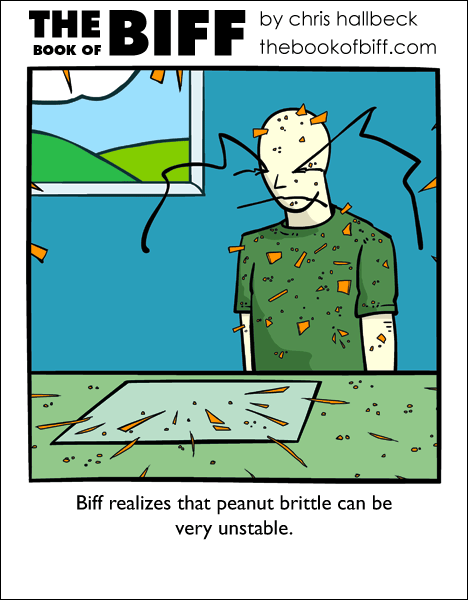 hey maybe if biff ever makes an enemy, he could make some peanut brittle, too. for them. For the sake of the denizens of Balloon Planet Alpha, I hope they never cross Biff. LOL, you made me laugh again. Actually there is such a substance. It’s called saliva. Not quite effective, but that’s the price for not dissolving your teeth. My brother-in-law is allergic to nuts, so every year my Gra’ma makes him Coconut Brittle. It’s actually quite good. I detect a thematic link in this week’s episodes. oh because everything explodes on it yea. Well then why does he have so many near-copies of that same picture? and if it’s a window why does he have such an unobstructed view? did all his neighbours move b/c of the constant explosions? This brings up a question. Has Biff ever opened his mouth to eat? Oh man, I love peanut brittle! Except whenever I eat any American candy with peanuts in it, it’s very salty. Is that just an American thing? Because the peanut candy here is very sweet. Oh, peanut brittle, my ancient nemesis. The peanut brittle one of my friends got over the holidays was amazing. I don’t like peanut brittle to begin with, but I just couldn’t stop eating it! And to make things better, it didn’t stick to my teeth at all. I wonder if anyone’s ever made just brittle. Like peanut brittle, but with no peanuts. I think I’d get huge if anyone ever made me some. …this seems familiar…oh yeah, Biff had a lot of food on him. His shower drain must be a monster to handle it all. @Gobbledegook – I had some cashew brittle just a few weeks ago. @Aytug – Haha, well the little blog comments that I write are usually the last thing I do before getting ready for bed. So I’m usually half asleep already when I write them. If you make your own, add 1 tsp baking soda – it will make the brittle even MORE brittle and it will dissolve in your mouth more easily without getting in between your teeth. OTOH, if you add too much, you’ll have a result like what is pictured today. Want a great recipe for microwave (pea)nut brittle? eamail me at adenning@wi.rr.com . . .
What happens if your girlfriend accidentally uses *your* acid-mouthwash? Face-meltingly bad idea! So why am I giggling..? I like how in all the comics from #430 to this one were basically Biff standing over a kitchen table with food on it. The acid thing would be good for people like me, who eat excessive amount of things like popcorn, jerky, taffy, and rock candy. Especially since I have braces now. But… for those who have braces, wouldn’t the acid melt the braces since they’re not part of you and don’t have your DNA? Guys, all you need (or could) do is get some sucrase, glucase, and fructase, and suspend them in water. Take a mourthful, wait a few moments, and spit/swallow. There’s no danger invloved, since enzymes are substrate-specific, and it’s generic enough that anyone could use it! Lactase is already commercially available, so a few other sugar-lysers shouldn’t be too hard to get ahold of. WHAT THE HELL IS PEANUT BRITTLE?! Did anyone happen to notice that the brittle was also sticking out of the black box border of the comic? I despise (mostly) peanut brittle. The aftertaste is yucky and my teeth feel like they are rotting on the spot. Just like my I.Q. and Spongebob *shudder*. Peanut brittle = solidified, sugary stuff that breaks rather easily, but makes REALLY sharp edges [my throat took a while to recover ;( ]. It’s like solidfied peanut butter with nuts in it or something. It can be ridiculously fragile, or can stop a bullet (figuratively) depending on the mixture you used. Biff is his own worst enemy and bestest friend, remember? Besides, Biff’s house probably spontaniously combusts according to the RNG (random number generator) Biff installed on the nuclear fusion core control system in the basement, so I doubt anyone would DARE try to attack BIFF of all people. All they need to do is sit back and watch the show as Biff tries to calm his feral buzz-saws w/Gopher DNA as they attack his poor bologna trees. I never make brittle with nuts, or legumes as peanuts are.